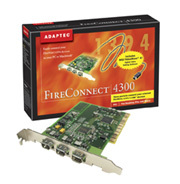 Small but powerful driver for quickly enable PCI FireWire (IEEE 1394) Adapter such as Adaptec AFW-4300 FireConnect Adapter, Orange Micro Inc., OrangeLink FireWire PCI Board, etc. FireWire Mass Storage Enabler is a class enabler. In other words it will enable any PCI FireWire Adapter regardless of PCI adapter manufacturer and model. 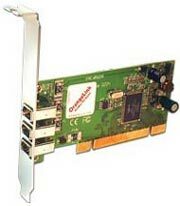 Supports any FireWire (IEEE-1394) PCI adapter compatible with OHCI specification. Cooperates with IEEE-1394 BIOS. Do not disturb functionality of devices configured by BIOS. Support of FireWire (IEEE-1394) Device normally requires a whole stack of drivers. Usually you need at least a PCI enabler (unless your PCI FireWire (IEEE-1394) controller is configured by computer BIOS), and functional driver (e.g. hard disk). FWMASS provides both: a PCI Enabler and build-in functional drivers for FireWire (IEEE-1394) Disk and FireWire (IEEE-1394) CD-ROM. Generally speaking as long as your FireWire (IEEE-1394) devices are limited to FireWire (IEEE-1394) disk and/or FireWire (IEEE-1394) CD-ROM, you do not need any of third party FireWire (IEEE-1394) driver - FWMASS will do the job. In difference with any other FireWire software, FWMASS by default do not change configuration of FireWire (IEEE-1394) PCI adapter assigned by BIOS and therefore do not disturb work of any device supported by BIOS.